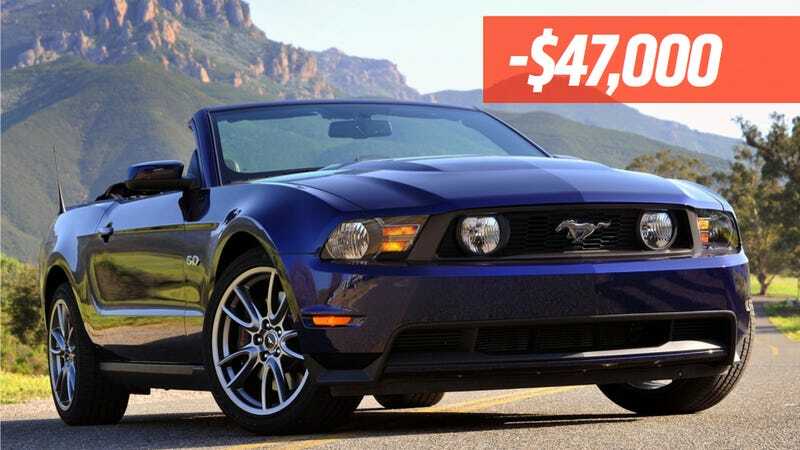 Here's a nice little nightmare scenario: You splurge on a convertible Mustang GT at the Enterprise lot instead of a miserable Corolla or whatever, only for the car to get stolen after you returned it, leaving you with a staggering $47,000 bill. That nightmare is the reality faced by Nova Scotia woman Kristen Cockerill, who, according to the CBC, is now stuck with a giant bill for the stolen Mustang she cannot afford. The story says that Cockerill rented the Mustang from an Enterprise lot in Dartmouth, Nova Scotia in October. She dropped the car off on a Sunday and left the keys in a secure drop box, but the next day Enterprise called her to say they had the keys but no Mustang. "I was pretty panicked, wondering where this car went, and actually went in to the shop that evening after work just to speak to [the clerk] in person and kind of find out what's happening here," she said. Police determined the Mustang had been stolen, and on Monday, Cockerill received a $47,000 bill to replace the Mustang (It's more expensive in Canada). Cockerill's insurance company says the car wasn't in her control, so the theft isn't her responsibility, the CBC reports. But Enterprise has told her that if the insurance doesn't cover the theft they will charge $47,000 to the credit card she used to rent the car. The CBC says Enterprise is working on some kind of a solution to the problem. "We are continuing to review the case," Enterprise spokesman Ned Maniscalco wrote CBC in an email. "It is our intention to work with the customer and her insurance company to achieve a fair and reasonable outcome." "Sometimes customers mistakenly believe if they didn't personally cause or witness any damage that they are not responsible," Maniscalco said. "This is one of the most common misconceptions," he said, "In fact, customers are financially responsible for any damage or theft that occurs during a rental transaction, regardless of fault or negligence — just as if they owned the rental vehicle themselves." Even if the theft happens at the Enterprise lot after the car was dropped off? That doesn't seem very fair. Let's hope the car gets recovered, or Enterprise comes to a solution that doesn't break Ms. Cockerill's bank. Update: Good news! The CBC reports that Enterprise backed off and Cockerill doesn't have to pay for the stolen car. The rental company even apologized for what they put her through. How nice.